Our Next Limited Edition Tee, “Bob-OMB” By Mark Chilcott, NOW ON SALE! Our next limited edition, screen printed tee, “Bob-OMB” by Mark Chilcott, is NOW ONSALE! To pick up this tee, strictly limited to an edition of 100, head on over to www.CultCollective.co.uk. Based on a print produced for Bottleneck Gallery, which you can still buy HERE, “Bob-OMB” will be produced in a strictly limited edition of 100, be printed on high quality white cotton t-shirts using super soft water based inks and come branded with a screen printed Cult Collective logo and size in the neckline. Each tee will also come with a signed certificate of authenticity so that you know it is a genuine Cult Collective product! Please allow 6 to 8 weeks for your tee to be delivered. We are big fans of Mark’s and we are really pleased to be working with him on this tee. You can more of his work on his website and follow him for future releases on Twitter! “The World’s Finest Tee” By Matt Ferguson – The LAST Few Are Now Available. “The World’s Finest Tee” by Matt Ferguson has now whisked it’s way off to the printers. A huge thanks to those of you that picked one up. We hope to have it with you in the next 4 weeks and you won’t be disappointed by this awesome tee! There are a very limited number left in our online store and Matt Ferguson will also have some available at Thought Bubble. Once these are gone, that’s the full 100! If you have been sat on the fence, act quickly! Now is your last chance before they are gone forever!!! It’s The Last Couple Of Days To Pre Order Our Exclusive “The World’s Finest Tee” By Matt Ferguson From Our Online Store! All this week we have been harping on about our first ever t-shirt release, “The World’s Finest Tee” by Matt Ferguson. Well, you now only have a couple of days left to pre order yours from online store ! Based on one of Matt’s classic prints, “The World’s Finest Tee” will be produced in a strictly limited edition of 100, be printed on high quality cotton t-shirts using super soft water based inks and come branded with a screen printed Cult Collective logo and size in the neckline. If you are a fan of Matt’s work, this is a must buy! Once they are gone, they are gone! Read on for more details! Our Exclusive “The World’s Finest Tee” By Matt Ferguson Is NOW AVAILABLE In Our Online Store! If you saw our post a little earlier on in the week, I am sure you are desperate to pick up your own “The World’s Finest Tee” by Matt Ferguson. We the good news is that it is now available in our brand new online store ! Check Out Our Brand New Online Store And Exclusive “World’s Finest Tee” By Matt Ferguson! For a little while we have been teasing that we were getting ready to release something a little extra special and we are so please to finally share it with you! What could be more special than announcing our brand new online store and our very first release? We present to you; “The World’s Finest Tee” designed by Cakes and Comics himself, Matt Ferguson! Strange Kids Club Go Totally Tubular With “Turtle Kong” Their Latest Mash Up T-Shirt And Sticker Set! What has four heads, eight arms and a gargantuan appetite for cheese, tomato sauce and sourdough? A radical, radioactive mutant named Turtle Kong! Forget the sewers-these brothers are breaking loose in one of the most “totally tubular” t-shirt releases of all time. Tomorrow, July the 17th, those cosmonauts of pop culture nostalgia, Strange Kids Club, will be releasing for pre-order their next exciting parody apparel product line, designed to give any fan a case of King Kong-sized shell shock. Mashing up the mighty King Kong and Teenage Mutant Ninja Turtles, Strange Kids Club have revealed a limited edition, Full colour t-shirt designed by James Callahan of Barf Comics and a set of six (6) 4″ collectible Circle Jerks Stickers, inspired by some of the mightiest mutant animals this side of the sewers. There are many filmmakers who have produced one or two masterpieces in their careers, but it is a rare thing for them to produce consistently critically acclaimed, commercially successful and just damn exceptional movies. Quentin Tarantino and the Coen brothers are an exception to that rule. 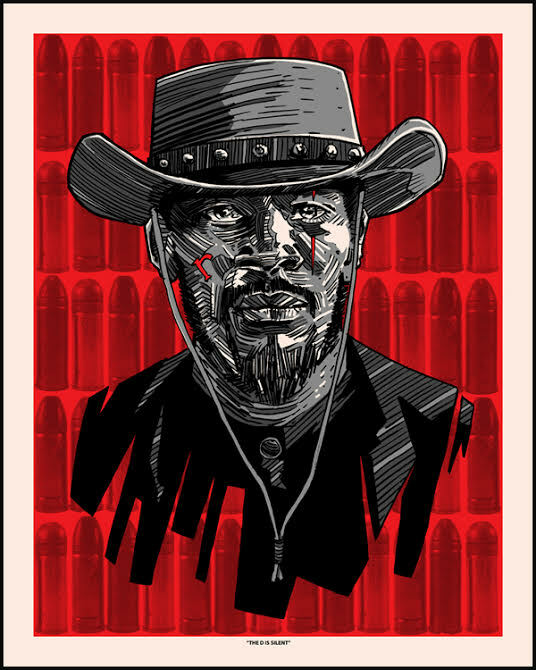 As a celebration of their phenomenal careers, Spoke Art have brought together 60 exceptionally talented artists to interpret their favourite scenes, characters and movies from the filmmakers back catalogues for their upcoming exhibition, ‘Quentin Vs Coen’. Those cosmonauts of pop culture nostalgia, Strange Kids Club, are proud to reveal the first of two limited edition apparel designs inspired by cinematic milestones from the 1980s. 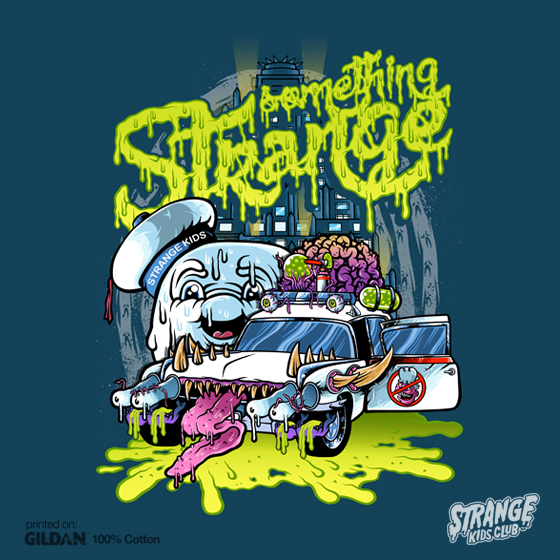 Showcasing custom graphics that playfully capture each film in a distinctly offbeat manner, the first t-shirt design, Something Strangefeatures the work of Matthew “Raw Meat” Doyle and will be available for pre-order beginning June 5 at 10:00am CST through June 13th via the Strange Kids Club Online Store. With the timed release running until Friday June the 13th, their is plenty of time to get your hands on this wonderfully fun t-shirt which will be printed on 100% cotton Gildan shirts (unisex) and will cost $23. 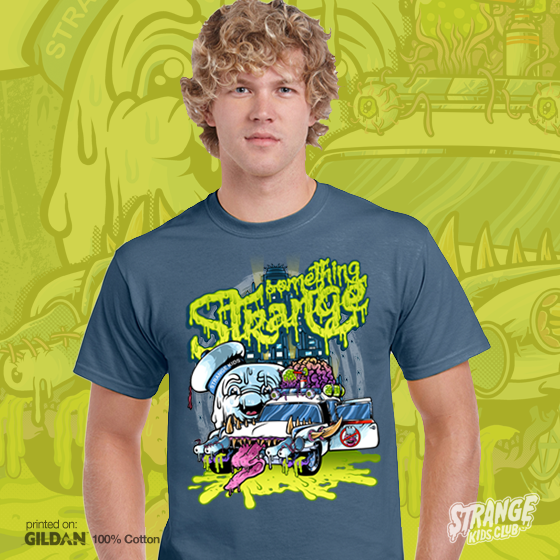 So, if you are fan of a certain band of ghoul bustin’ New Yorkers, you may want to head over to the Strange Kids Club Online Store from Thursday June the 5th. Make sure you follow the guys over on Twitter and Facebook and check out some other cool items you can pick yourself up on their store! Will You Be Wearing The Mondo ‘237 Collection’ This Autumn? So, here is something new from the Mondo guys, the ‘237 Collection’. Mondo have teamed up with Middle Of Beyond to produce a clothing and lifestyle line consisting of a sweater, cardigan, 6′ scarf, ski mask and two different sized floor rugs all inspired by the movie Room 237, a 2012 American documentary film directed by Rodney Ascher exploring the meaning and themes of Stanley Kubrick’s The Shining. Available for Pre-Order from today, and running through May 10th, Mondo aim to begin shipping in late August, just in time for the Autumn runway shows. You can see the full collection over at the Mondo Blog and order from their Online Store. 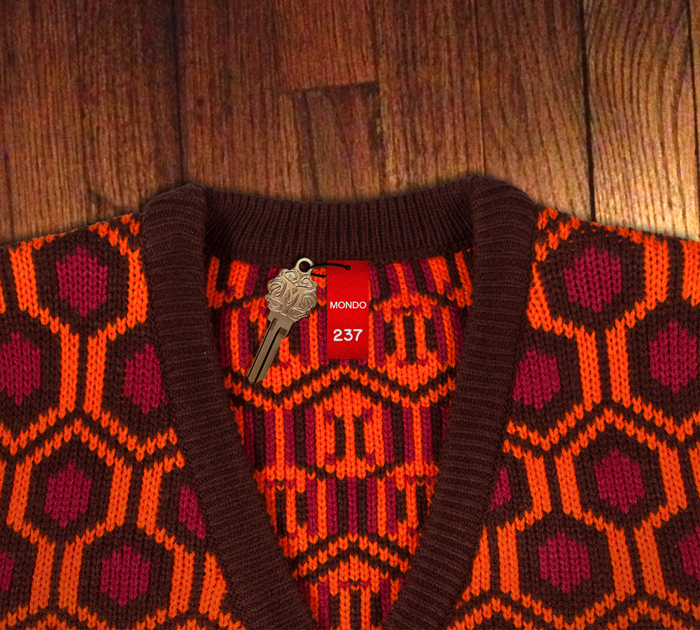 Here is a closer look at that custom die-cut Mondo Room 237 key that comes with the sweaters and cardigans, while supplies last. Keep tabs on Mondo by following them on Twitter where they will keep you posted on all future releases. Middle of Beyond can also be found on Twitter and Facebook! Olly Moss announces 'Silhouettes from Popular Culture' Special Limited Edition with unique Papercuts!